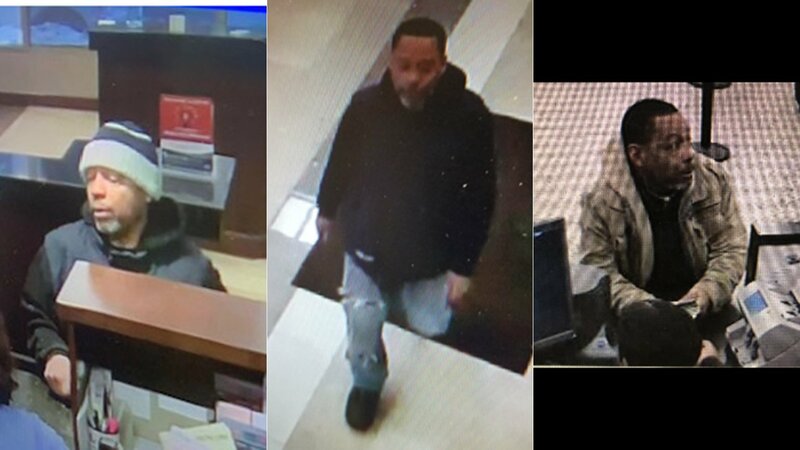 Chicago police are seeking help to identify a man suspected of robbing a pair of downtown banks last month. Investigators on Sunday released surveillance photos of a male suspect who’s accused of robbing the two banks in broad daylight, telling employees he was armed with a gun and demanding cash before fleeing the area. One bank is located in the 0-100 block of South Dearborn Street. It was robbed just after 1 p.m. on Jan. 16. The other bank is located on the 1300 block of South Michigan Avenue, which was robbed at 3:47 p.m. on Jan. 31. The suspect said he had a gun and demanded money, according to police. Once he received the money, he would leave the bank and take off in “various” vehicles. Police describe the suspect as an African-American man with short black hair and a black and gray goatee. He's in his late 40s or early 50s, between 5-foot-2 and 5-foot-6, and around 150 to 180 pounds. Anyone with information about the suspect is asked to contact Area Central detectives at 312-747-8384.